FPD CORPORATION CZ was founded in January 2007, with the main focus on providing equity, debt financing, and venture capital to promising Czech and Slovak businesses. Since our inception we have steadily grown into a large and profitable investment company with an extremely well diversified portfolio, and as well as having a successful domestic structure, we are also expanding on a global level, thus diversifying our holdings even further. Our main goal is to provide the best possible risk and return trade-off for our shareholders, and when considering different investment opportunities, internal, industrial, as well as macroeconomic factors play a key role in our decision making. As per our investment philosophy, we strive to provide financing to undervalued companies that have an attractive business plan, strong cash flow positions, and potential for long-term growth. 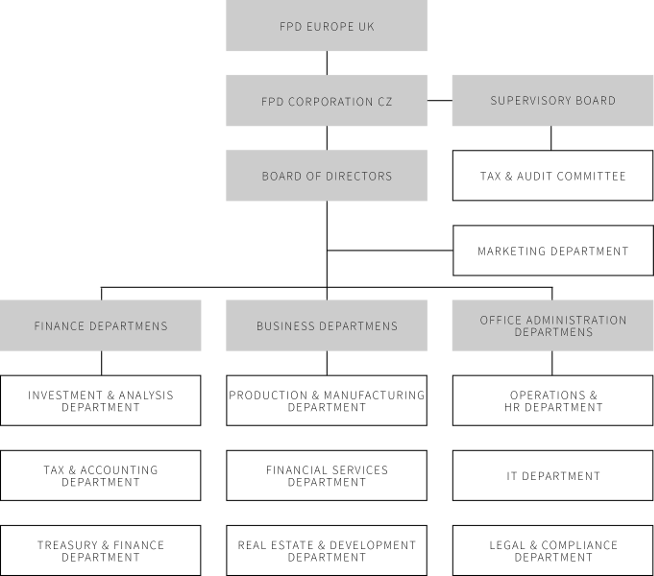 As well as capital funding, FPD CORPORATION CZ can provide professional assistance with regard to corporate restructuring and optimisation of costs and revenues. Our proven investment strategy allows us to operate in many different industries, not just at a domestic level but also in the global market place. FPD EUROPE LIMITED Registered in the United Kingdom under number 08138366, with its registered office at 6th Floor, 94 Wigmore Street, W1U 3RF, London, and with a subscription of 1354 shares (100 %).